What charisma! 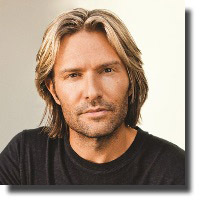 Composer Eric Whitacre is indeed a true choral phenomenon. His personality and his style have enchanted singers and audiences everywhere and his conducting and delivery of his choral compositions last Saturday merited a prolonged standing ovation from a jam-packed audience. I enjoyed most his jocular e.e. cummings choral composition of "i walked the boulevard" and Mexican poet Octavio Paz's "Cloudburst" sung in the original Spanish. The audience participated in this piece by clicking their fingers to simulate raindrops. But everything he did on stage was fabulous. He joked about a hot Jewish soprano (Hila Plitmann) he stalked until she finally gave in and married him. The VCC sang five of Whitacre's compositions of Plitmann's songs in Hebrew. He also made the audience laugh about his composition of Rudyard Kipling's "The Seal Lullaby" which he was excited about because Dreamworks was interested in doing an animated version of this poem. Well, it didn't pan out because they decided to do Kung Fu Panda instead. "Leonardo Dreams of His Flying Machine" from his friend poet Charles Anthony Silvestri was another highlight in this concert, where sounde emitted from the chorus of Leonard da Vinci flying his machine evoked the dream of flight. The last piece also by Silvestri, "Sleep", was performed by around 200 choir members from Vancouver Chamber Choir, Pacifica Singers, The Focus! Choir, and the Special Whitacre Choir of Secondary School Singers (one of whom had green hair and slightly distracted my attention). This was an almost hypnotic song with the last words "Sleep, sleep, sleep" as though telling the audience that it was time to go home and sleep on this rainy night. This was an excellent concert and this is Whitacre's first visit to Vancouver. I hope he returns because the audience was awed by him. He also has virtual choir experiments on the Internet which have fascinated music lovers around the world.